Between the rumored shake-up of President Trump's circle of trust and his recent involvement in the conflicts in Syria, some of Trump's loyalist supporters are beginning to question if they are still on the Trump train. According to one ex-Breitbart executive, if controversial chief strategist Steve Bannon is among the aides Trump dismisses, things could get extremely ugly for the president. "If Bannon is pushed out it will be open warfare from the outside in," Bardella warned. "And all of the sudden the pages of Breitbart, who have been incredibly generous to Donald Trump to say the least, will start turning their fire on him or, at the very least, assign blame saying Trump betrayed the conservative right because of Jared Kushner and liberal Democrats inside the White House have turned them against us." 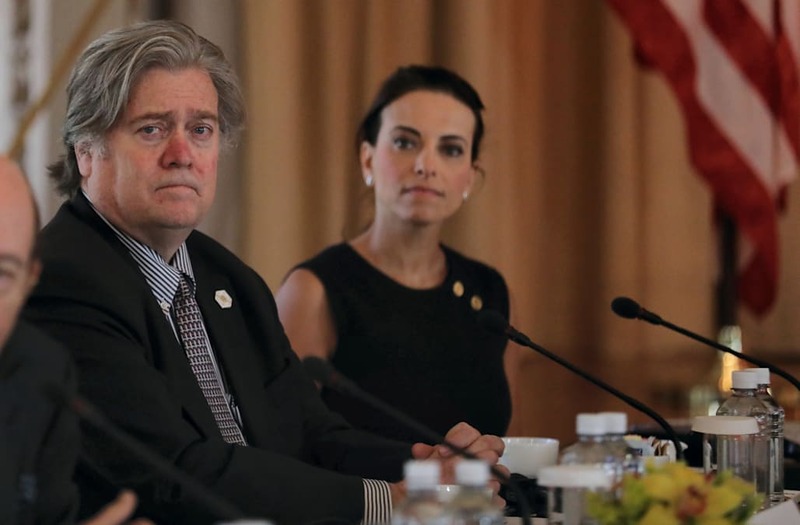 "They're concerned they are about to lose their link to the West Wing and direct access to the president through Steve Bannon," Bardella explained. "Clearly Steve is under siege right now. The fact that so many on the conservative right so forcefully came out against the actions of the president and strikes in Syria just tells you how much trouble Steve actually really is in." "But they are really going out there publicly, hammering Jared Kushner-aligned strategies because they see Steve could be in jeopardy and could be asked to leave at some point in the near future," he continued. Bannon has been slowly losing grip on a spot at the table in the White House this week following his demotion from the National Security Council. Toss in the reports that Bannon and Trump son-in-law Jared Kushner are not at all on the same page — forced to have an impromptu meeting recently to try to squash their differences — and things don't look good.